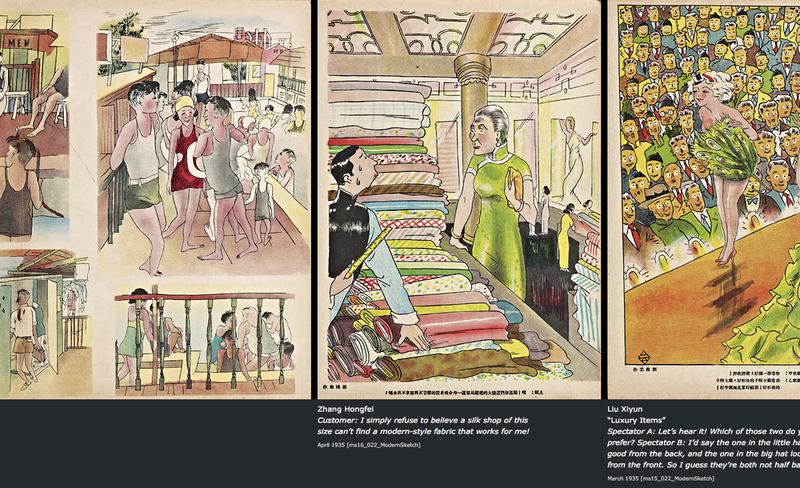 MIT Visualizing Cultures weds images and scholarly commentary in innovative ways to illuminate social and cultural history. As Creative Director, I designed the approach and collaborated with some 20 scholars on more than 40 units based on the visual record of events in Japan, China, and the Philippines. 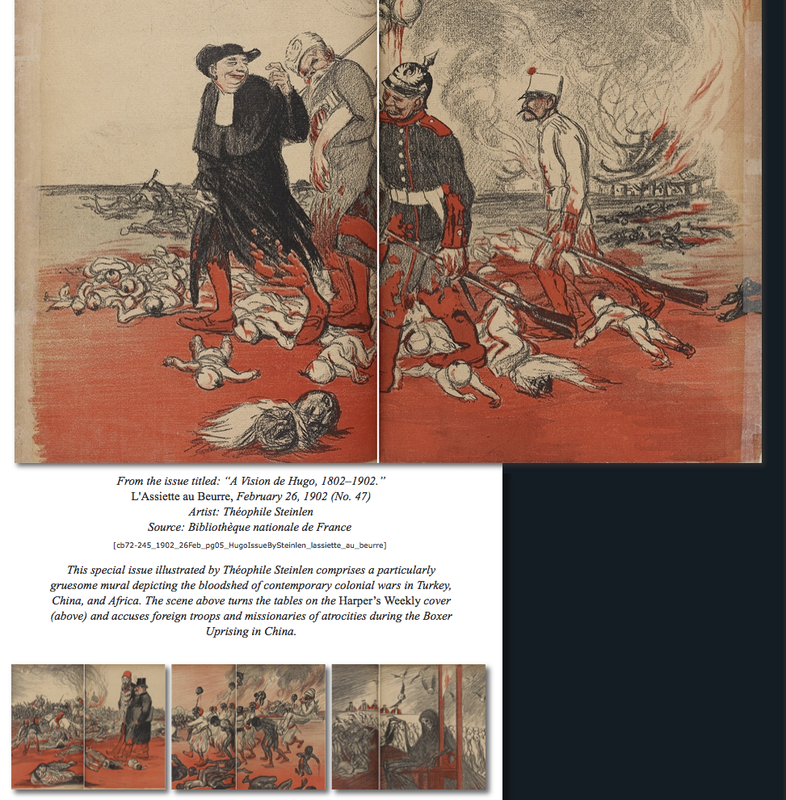 My own unit, "Civilization & Barbarism: Cartoon Commentary and the 'White Man's Burden' (1898-1902)" was published in fall 2014. 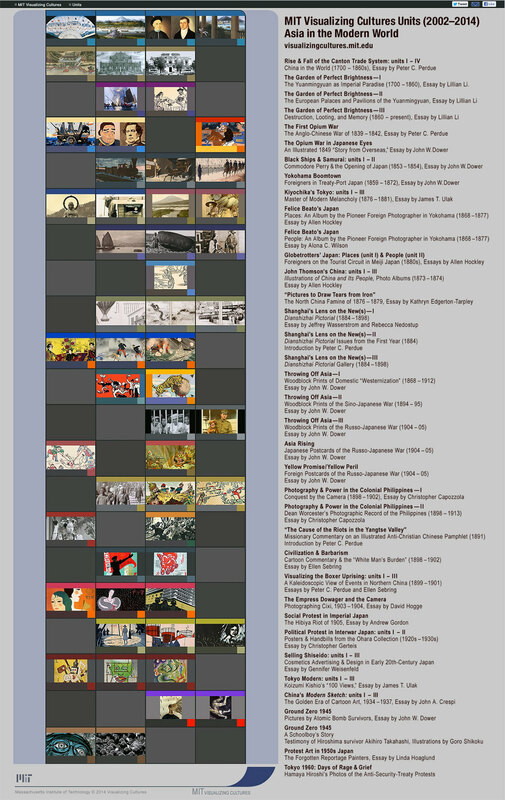 The Visualizing Cultures menu groups units by author, image source, chronology, and topic. 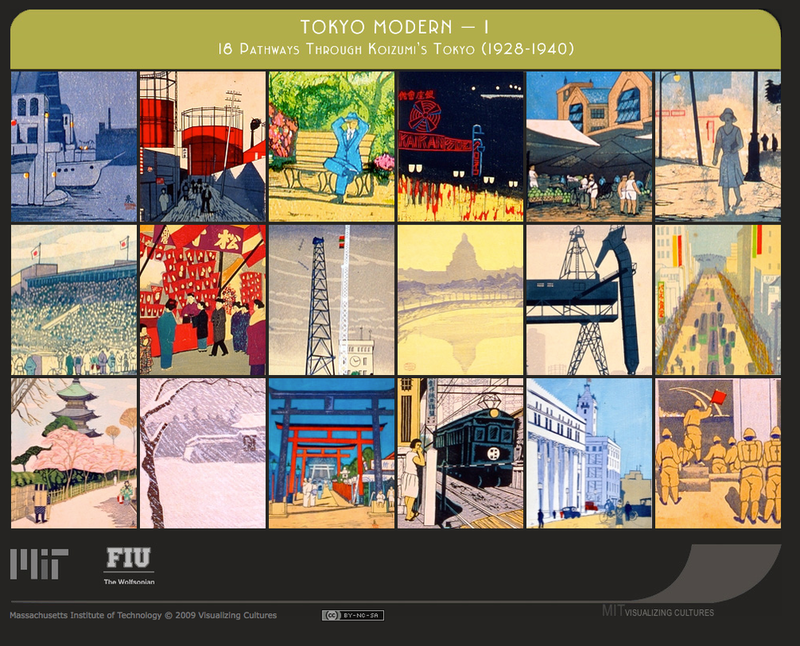 Founded in 2002 at the Massachusetts Institute of Technology by Japan historian John W. Dower and linguist Shigeru Miyagawa, Visualizing Cultures explores the web as a publishing platform enabling scholars to examine large bodies of previously inaccessible images; compose texts with unlimited numbers of color, high-resolution images; and use new technology for unprecedented ways of analyzing and presenting images to open windows on modern history. 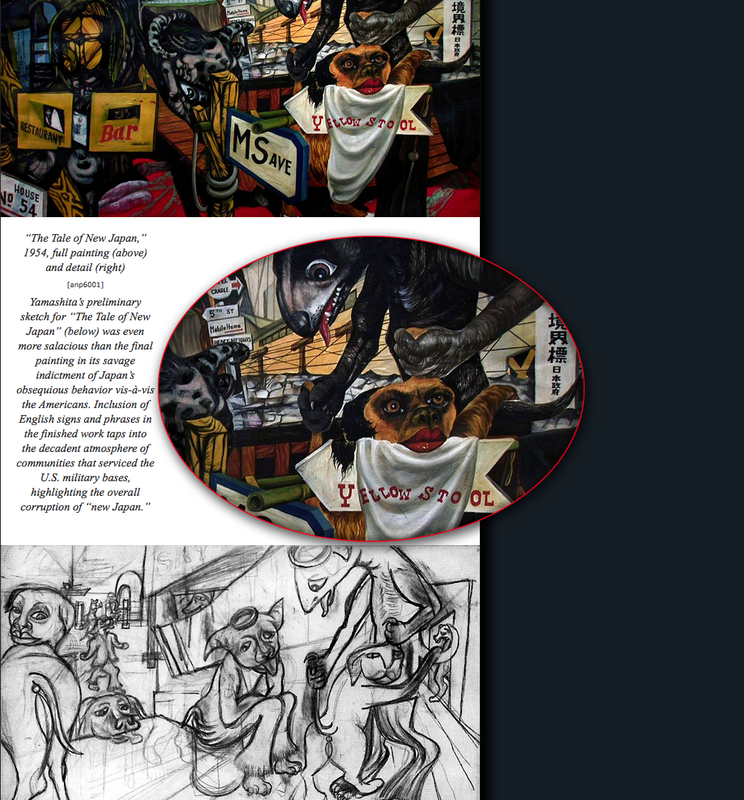 Publishing on OpenCourseWare, an early initiative to make all MIT courses freely available on the web, Visualizing Cultures negotiates with institutions to use images for educational purposes under a creative commons license. Pedagogy has been furthered with secondary school curricula commissioned for the site and teacher training outreach events. 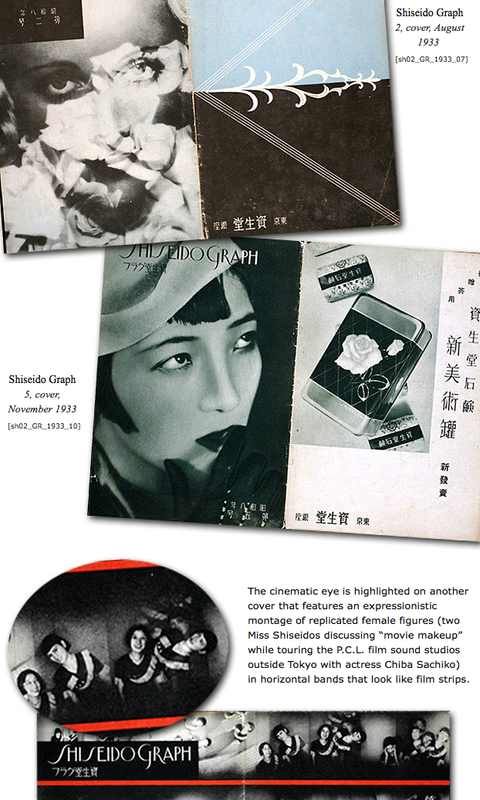 Image-driven scholarship was the subject of four co-sponsored conferences, "Visualizing Asia in the Modern World," at Yale (2010 and 2013); Harvard (2011); and Princeton (2012). A seminar is planned for Yale and MIT spring 2015. The course ran Sept. 3-Oct. 22 with discussions, polls and word clouds. An archived version of VJx can be taken at any time. Detailed scripting by professors John W. Dower (MIT) and Andrew Gordon (Harvard), with lead content developer Ellen Sebring (MIT) gave an image-driven structure to the online lectures and the courseware. This exhibition draws on artwork produced in China for Western consumption between the late 18th and late 19th centuries. Because the Qing dynasty exercised control over trade with Europe and the United States through the city of Canton (now Guangzhou), foreign merchants resided there under tight restrictions for six to eight months each year. Although known as “the Canton trade system,” the large Western trading ships never actually made it to Canton. They entered China from the Portuguese colony of Macau, and then hired Chinese pilots to guide them up the perilous Pearl River to the great anchorage at Whampoa island. From there they relied on small Chinese vessels to ferry goods to and from Canton. China had many products desired by Westerners, including tea, raw silk, and luxury items such as porcelain, lacquer, and furniture. The West offered little of interest in return. Led by England, huge quantities of silver bullion initially were exported to China, but in time the major foreign export became opium (produced mainly in colonial India). When Qing officials attempted to suppress this, the British and their allies responded with the devastating Opium War of 1839 to 1842, following which China was forced to open additional trading ports led by Hong Kong and Shanghai. Although some foreign merchants objected, opium remained a primary export thereafter. 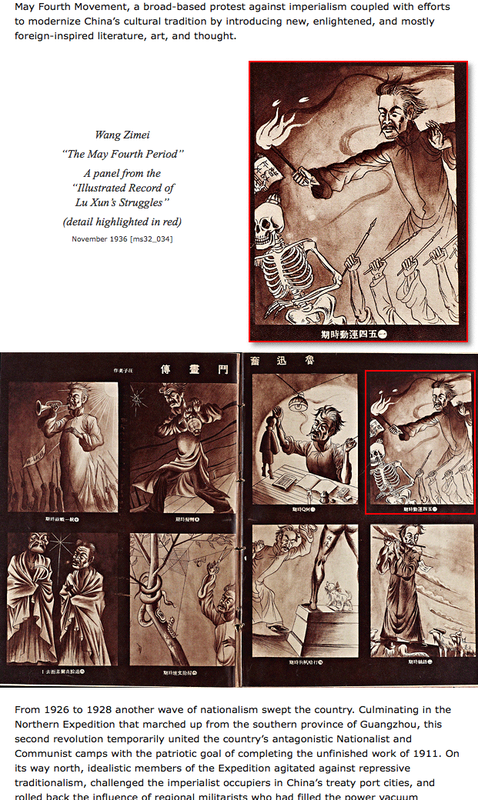 The visual picture of the China trade that Western merchants conveyed to audiences back home usually ignored opium, however, and relied on paintings and artifacts that celebrated both the dynamism of overall commercial transactions and the brilliance of Chinese arts and crafts. 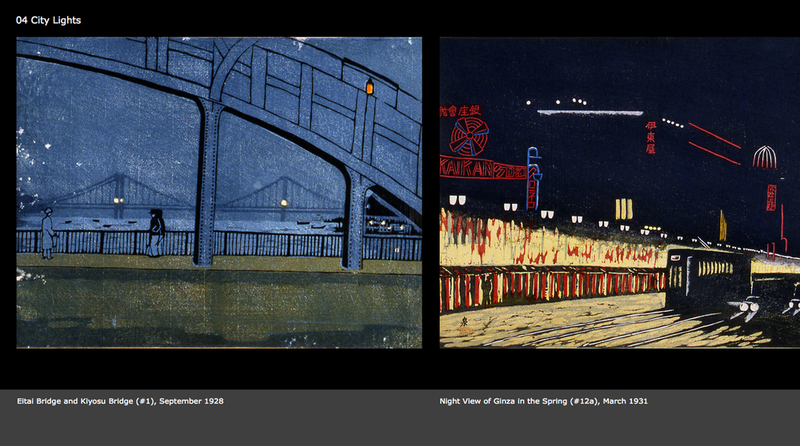 Based on an exhibition, "Kiyochika: Master of the Night," that ran March 29–July 27, 2014 at the Arthur M. Sackler Gallery, Smithsonian Institution in Washington, D.C., this unit by curator James T. Ulak both preserves and reworks the window Kiyochika's prints provide on Japan's movement towards modernity. With the Meiji Restoration in 1868, Kobayashi Kiyochika (1847-1915), who had fought on the side of the defeated Tokugawa shogun, retreated to the provinces for a hiatus of six years. He finally returned to the capital in 1874. Between 1876 and 1881, he produced an unusual series of woodblock prints titled “Famous Places of Tokyo.” These elegant views convey a sense of both change and loss strikingly different from the brightly colored prints of his contemporaries that celebrated Westernization in all its forms.